Although our quest for morels early in May proved to be a bit premature, we've hearing reports from several reliable sources that they are finding these highly prized mushrooms east of I-5 in the Klamath Falls and Lake of the Woods area, as well as in the Wallowas. They were all at high elevation, something in excess of 3,500 feet. 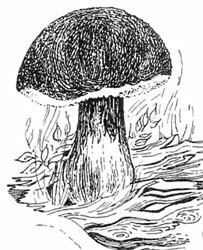 Our resourceful mushrooming buddies boast that their specimens this year are very large in size and in quantity. At this time, Mt. Hood doesn't seem to be an extremely productive area according to our sources. For us personally, we've typically found that the end of May through June seem to be the prime moreling season on Mt. Hood. Don't settle for a sketch, as beautiful as it may be! Go out and gather spring boletes! Oh, and one more thing. We've given up picking in burns - the charcoal and other debris don't make for an enjoyable experience, regardless of how plentiful the morels may be! Part of our spring thing this year was to head East to Crescent Lake and Klamath Falls, with a stop at Chiloquin to visit with dear friends Eve and Steve, who moved there last year. In addition to being long-time friends, Steve has served as my photo guru for years, and a number of his photographs (always credited to him) grace these pages. Sometimes I fear that those of us on the coast tend to forget how much beauty there is to enjoy East of I-5. Steven and I were frequently reminded of this as we made a circuit that included stops in Crescent Lake, LaPine, Crane Prairie, Klamath Falls, and Medford. Crescent Lake seemed much cooler than our visit last year at this time, and we were caught a little off guard by the light snow flurries that made our last morning more memorable at the resort. 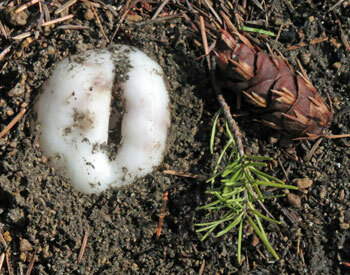 Still, walks in the conifer forests offered springtime rewards such as a fine collection of emerging earthstars and puffballs, along with some eye-catching badger entrance holes. This Earthstar is about to emerge. A recent trip to Astoria found us charmed once again by this historic outpost, this time in particular by the stories of the volunteer conductors on the Riverfront Trolly - where else could you hear the tales such as old timers who discreetly entered a nearby brothel by passing through the doors of the hardware store which was below the "house of ill repute?" It was a warm and wonderful spring weekend in Astoria, and we enjoyed walks along the Astoria Riverwalk, a 5.1 mile, west - east path, spending way too much time photographing the river birds as they frolicked on the abandoned piers. Watching water fowl is a special spring thing. 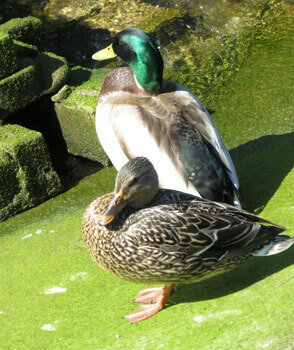 The ducks were so playful in the springtime sun! 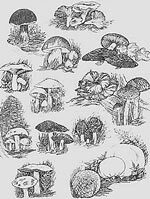 May, 2014's Recipe of the Month: Brenda Jackson's "Mushroom Wraps"
Brenda was accurate when she described her Mushroom Wraps as "little bundles (that) are the best of a stuffed mushroom and a crispy won ton." Or, more simply put, they're little bundles of heaven that you are bound to come back to again and again. "I do enjoy creating new recipes. I was recently on a Food Network competition show and my dish did have mushrooms in it also. I was chosen as one of Americas top 18 Home Cooks, and the show was very exciting and FUN FUN FUN. We shot the show on the set of Chopped. I was also lucky enough to have been chosen for the 2013 Pillsbury Bake-Off Contest that was in Vegas and that was a great time also. I only enter contests when I have an original I know is delicious and may have a chance. Creative Cooking is becoming a very competitive hobby and the money is getting better and better each year. I am a correctional Officer in a male prison here in Maryland with a very stressful position. 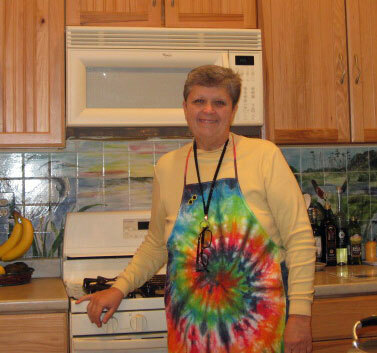 Cooking is very relaxing, and I love to see the reactions I get from some of my creations." wraps with homemade hoisin sauce are a wonderful treat!